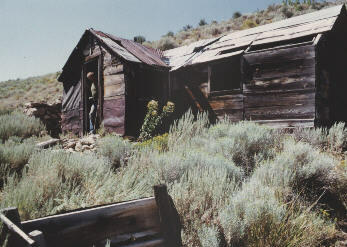 Gold was discovered on the west slope of the Hot Springs Range in 1898. By 1904, the Dutch Flat Mining Co. was using modern equipment to mine the area. Lack of water seriously hindered mining efforts and the company finally gave up after a few years. In 1909, the Chinese began extensive operations using water carried in by a line of Chinese water boys. The district was worked by leasers in later years. Nothing remains today except for the one building pictured above. The area is well secluded. Wood is available for campfires. A better camping location is located about an hour away in the deserted town of Jumbo.